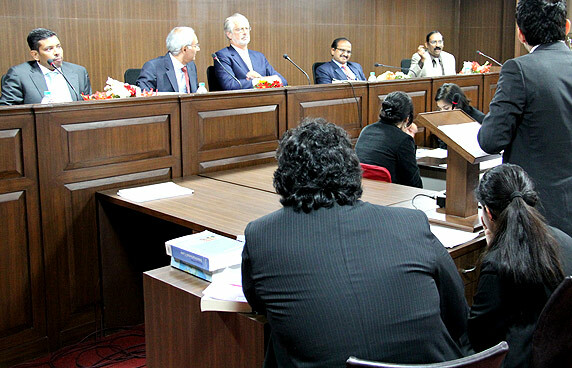 National Law Institute University, Bhopal, in collaboration with Surana & Surana International Attorneys is organizing the North India Rounds of the Surana and Surana National Trial Advocacy Moot Court Competition 2016 and Surana & Surana National Judgment Writing Competition from 9th to 11th September, 2016. As has been the tradition, this year’s problem would also be based on contemporary issues on criminal law in India. Further, this moot is the only one in the country to adopt the unique format of following the full trial procedure including witness examination. Along with the Moot Court Competition we would also be hosting a Judgment writing competition which would be open to all participants of the moot court competition.The moot court problem and the rules of the competition have been attached to this email. The information will also be available on the SSIA website (www.moot.in) as well as the MCA blog (http://www.nliu-mca.blogspot.com). We invite your team on behalf of NLIU Bhopal and Surana & Surana International Attorneys, Chennai. We are looking forward to your participation. Please feel free to email/telephone us should you have any further clarification or suggestions at our contact details as given below.